Katalox Light® is a new brand of revolutionary advanced filtration media completely developed in Germany. It's composition simply makes it outstanding against the contemporary filter media available in water treatment industries, like sand, BIRM, Greensand Plus, Manganese Greensand etc. Katalox Light® is manufactured in Germany. Katalox Light® is engineered with unique MnO2 coating technique on ZEOSORB®, providing it light weight, higher filtration surface, more service life and more reliable performance (filtration down to 3µm) than any other existing granular filter media. 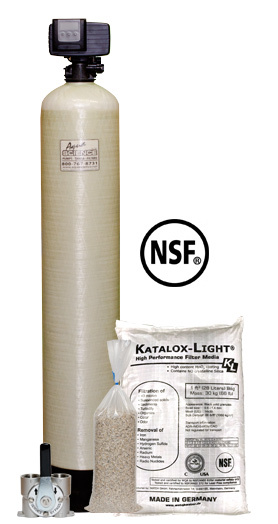 Katalox Light® is being used in numerous system for residential, commercial, industrial and municipal applications worldwide, for High level filtration, color and odor removal, Iron, Manganese, Hydrogen sulfide removal, efficient reduction of Arsenic, Zinc, Copper, Lead, Radium, Uranium and other radionuclides and heavy metals. Katalox Light® is ANSI/NSF 61 Certified for drinking water applications and has met the ANSI/NSF 372 Lead free compliance.